Hi All, I'm working on building a pedicab to bring to the Playa this year and trying to figure out the correct wheel size to use to ensure I'm able to get sufficient traction. I have basically the same chassis as this pedicab (https://www.coastercycles.com/the-pedicab/) but need to determine what wheels to use, and would love guidance from anyone who has experience with pedicabs in the past! 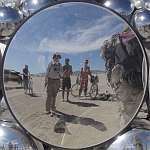 The general rule of thumb on the playa about wheels is bigger is better. You never know what surface you’ll get in any particular year. Sometimes it’s hard and packed and smooth. Sometimes it’s soft and silty and hard to ride a bike in at all. This is the recommended configuration for trikes on the Playa. Or both, even on the same street. Fatter is more likely to do the job. You can pump them up tight if you've got hard pack, and down to normal pressure (for fat) if you've got soft. But even some soft/silty conditions they'll sink in and bog. Not was bad as some snow where you have to lift and throw your bike forward and then wade after it, but when you're dragging your bike through some silt it will feel like it. What I've seen is just patches here and there, but some years have snakes/mini-dunes. The worst 'pond' of silt I've seen was five inches deep, 15' wide and nearly 30' long, and that late in the week. But you don't need fat (4", 5" 6") (unless we get a really really soft year). I'd say go as wide as is practical for your rims, without going so wide the rim is floating around on top of the tire while you ride. I had 3.8" on 50mm and that was a little sloppy. Reduce pressure and it was really sloppy, more like herding than steering. We have a mobility taxi camp that provides art tours, bar tours, and connection services for burners with mobility issues. We have a stable of pedicabs with drivers, and bike trailers outfit to carry riders. Our pedicabs include trikes, sidecars, and quadricycles. Nobody runs wheels smaller than 20". Tires are no smaller than 1.75/2". Traction is better on a multi wheel vehicle than a bike. Probably because the weight is distributed more evenly and you have better float. I run a 1kw front motor on one of my trikes, and its got a 24" street tire on it and had no problem at all even in the deep dust of the 9 o'clock side last year.